We would like to take this opportunity to wholeheartedly invite you to experience our forthcoming publication The Wax Apple. Over the years there have been numerous Laurel and Hardy publications of varying degrees of quality that have come and gone. Some of the better ones delved into meaningful research that have unveiled startling new depths in our studies of Stan Laurel and Oliver Hardy. The best of these publications are treasured among our collections and are stacked neatly beside our numerous books, just below a shelf full of statuary, positioned right next to our video and DVD racks. Yes, in essence, we are all hooked on these vintage comedians. 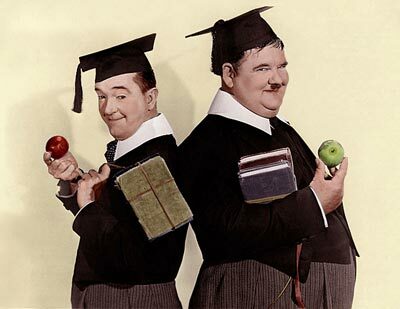 Not just Laurel and Hardy, although they are certainly the leaders, but on the other performers of the Hal Roach Studios as well: Our Gang, Charley Chase, Thelma Todd and Zasu Pitts, The Boy Friends, and Harold Lloyd – just to chip away at the surface.